By Blaine Harden. Viking, October 2017. 272 pp. Blaine Harden has written another captivating narrative on Korea, this time telling the story of an American military intelligence operative, Donald Nichols, who lived and worked in South Korea for eleven years before, during and after the Korean War. The book’s teaser promises a spy story with the intrigue of a great novel or film plus the added benefit of being a true story. Through a series of interviews, Freedom of Information Act requests on Nichols’ official performance files, legal proceedings for criminal conduct and obscure autobiography, Harden separates the tall tales from the facts to create a compelling story of a relatively unknown individual’s tortured participation in the American involvement in this critical period on the Korean Peninsula. Harden’s stated purpose is more ambitious than telling the story of one man. He uses this lens to explain the larger role of the United States in Korea under Syngman Rhee, expose human rights violations during this period and add to our understanding of the deep roots of North Korea’s animosity towards the United States. Admittedly, this reader was skeptical about the ability to shed new light on these larger historical questions through Nichols’ story, but Harden surpassed my expectations. He shows how this young American intelligence operative, who dedicated special attention to Korea when it was an unpopular and understudied posting, developed a unique personal relationship with the South Korean president, expanded his bureaucratic fiefdom and delivered intelligence results when these were in short supply and high demand. Harden persuasively shows that Nichols had an oversized role compared to his official position. Harden calls Nichols “a highly decorated U.S. Air Force intelligence officer who ran his own secret war for more than a decade” (8). He was particularly good at finding bombing targets for the Air Force that were often attacked with napalm, which Hardens says outside of the United States “was widely regarded as a war crime” (9). At the height of his authority, Nichols supervised up to 58 American and 200 South Korean intelligence operatives, which controlled more than 700 agents. To put the size of his operation in perspective, the United States had over 1.7 million troops in theater at the time and suffered 33,739 battle deaths and 103,284 wounded in the Korean War. Harden paints a vivid picture of Nichols that is colorful, heroic, tragic and criminal, but readers should be cautious about placing too much stake in this individual’s centrality to the broader war effort and the foundations of North Korean animosity towards the United States. Nichols had an impoverished and troubled upbringing. He joined the military to escape his dysfunctional family and quickly found himself in Seoul in 1946. He meets South Korean President Syngman Rhee, somehow manages to gain Rhee’s trust and builds an unlikely personal relationship. It is never precisely clear why Rhee befriended the much younger Nichols, and there is thin evidence that the intelligence operative genuinely leveraged this relationship for strategic information about Rhee’s plans and intentions during tense periods in the early US-ROK relationship. Nevertheless, from that vantage point, Nichols witnesses some of Rhee’s brutality before and during the war, including the execution of suspected communists and average prisoners in South Korea. Nichols photographed one of Rhee’s massacres and was part of the cover-up that would last for decades. Harden quotes a letter from US Ambassador John Muccio to General Willoughby that Nichols should stay in Korea because no other intelligence unit produced more useful information than the unit Nichols led. Unable to expel him, Willoughby hired Nichols away from the Air Force for Army intelligence. Nichols would earn 21 medals and by all accounts demonstrate bravery and dedication to his mission. Nichols took over codebreaking and jealously guarded the effort within his own unit. Like the CIA, he also ran perilous parachute drops into North Korea with no expectation that his Korean agents would return alive. He correctly forecasted North Korea’s invasion, but judged incorrectly on China’s intervention. Nichols was also a sexual predator in Korea and the United States. The evidence of his depredations is clearer in the United States due to legal proceedings, but the scale of Nichols’ abuse in wartime Korea is ultimately unknown given the blind eyes turned towards his activities. In the US military in the 1940s and 1950s, homosexuality was not tolerated. Nichols was a closeted gay man. Although his relationships with a variety of young South Korean airmen and soldiers were widely known among the Koreans in his unit, his abuse of authority never registered in his American performance evaluations or disciplinary records. He invented a story about a Korean wife and went to odd great lengths to perpetuate the claim—including having her name inscribed next to his on an unlikely two-person gravestone. Nichols remained in Korea after the war for four years. However, his behavior that American authorities tolerated during the war became more difficult to justify in peacetime. In 1957, he was removed from Korea and faced two formal investigations for his behavior. He was admitted to an Air Force hospital in Japan for psychiatric evaluation, diagnosed as schizophrenic and transferred to another Air Force hospital in Florida where he was subjected to electroshock therapy without his consent. He was eventually released and returned to civilian life with a suspiciously large amount of cash that he stored in a relative’s freezer. Decades later, Florida prosecutors charged him with pedophilia; Nichols fled to Mexico, and was arrested upon his return. He hired a famous attorney and beat the charges on a technicality. He abused children again and pled to the charges, and after committing further abuses while on probation he was sent to a psychiatric ward in Alabama. Given this pattern of abuse later in life, one is left to suspect the scope of his sexual crimes while in wartime Korea may be at least on a par with his crimes in the United States. No one is better placed to write this story than Blaine Harden. A New York Times best-selling author, Harden is a master of his craft. He knows Korea well, and his research has produced a treasure trove of information for a compelling personal account of a significant and virtually unknown American in the Korean War. 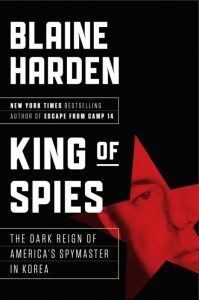 King of Spies is a page-turner that is difficult to put down, and I imagine many readers will finish it in one sitting. If a reader is looking for a personal story of a vividly conflicted and complex American spy in the Korean War, this is the book to read. My main critique is the narrative oversells the importance of Nichols to the broader history of the Korean War. Ultimately, this reader was not fully persuaded that Nichols was a “pivotal player” in the war or his “is not just the story of one American spy. It is a groundbreaking work of narrative history that—at a time when North Korea is threatening the United States with long-range nuclear missiles—explains the origins of an intractable foreign policy mess” (inside cover). Also, Harden’s descriptions of general Korean history are very good, but some characterizations fall prey to colorful writing at the expense of historical accuracy, such as Kim Il Sung’s role as “a self-proclaimed god” and characterizations that “upon his death in 1994, his son Kim Jong Il seized power” (emphasis added, 27). As general history, the frame of reference also creates some distortions. Nichols is the spymaster, but running just one of three US intelligence outfits in Korea at the time. The reader does not get the larger story of US intelligence in Korea, let alone the broader war effort or full political context. Nichols’ “dark reign” repeatedly shows, for example, morally reprehensible actions committed by US and South Korean personnel that create a sense of moral equivalency or worse with North Korean abuses that are outside the story’s frame of reference. Harden is well known for chronicling North Korean human rights abuses, but readers of this volume alone won’t be exposed to that overall balance. King of Spies is a remarkable historical account of Donald Nichols and worth a read, but readers should still augment it with the broader history to take away a balanced view of this highly consequential and devastating war.